Get your questions about Fire Protection Engineering Graduate School answered here. What is the benefit of earning a Master's degree? What are my options for earning a Master's degree in FPE at UMD? You can apply to the M.Eng. program, which is offered online and on campus. How does the Combined Bachelor's / Master's program work? If you meet the credit and GPA requirements (see above), you must submit a request to take graduate courses (as an undergraduate) and apply to the Graduate School. Students take three (3) graduate-level courses while earning their B.S., and complete the remainder of their coursework and thesis if accepted by the Graduate School. The entire program takes approximately five to five and a half years. See the Combined Bachelor / Master of Science or Combined Bachelor / Master of Engineering program page for more information. What are the differences between the M.S. and the M.Eng. programs? The Department of Fire Protection Engineering's Master of Science and Master of Engineering programs are not the same. Each program has its own requirements and options. Briefly, the M.S. program is offered only on campus and requires a thesis, while the M.Eng. program can be completed on campus, online, or both, and does not require a thesis. For complete information, see our M.S. vs. M.Eng. page. What are minimum requirements for admission to your M.S. and M.Eng. programs? Applicants who have not completed all prerequisite courses may still be admitted on a provisional basis if they demonstrate satisfactory academic performance in a related field and/or relevant work experience. These applicants are required to complete the prerequisite courses during their first semester at the University of Maryland. If you are applying to the Master of Engineering (M.Eng.) program, you do not need to submit GRE results. If you are applying to the M.S. program, in most cases, the application process requires scores from the Graduate Record Examination (GRE). Yes. Graduate research assistantships and teaching assistantships are available. Some FPE-specific scholarships are also available to graduate students. Please see our financial support page for more information. Yes, but only if enrolled in the Master of Engineering (M.Eng.) program. Am I assigned a research topic? If you are admitted to our M.S. program, you should start a discussion with the FPE Graduate Director and/or individual faculty members in order to identify both a research topic and a faculty advisor. Information on the Department's current research activities can be found on our research page. The M.Eng. program does not have a research component. Can I earn a Ph.D. in FPE? 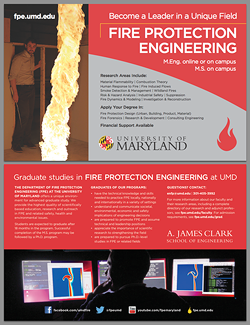 FPE does not confer a Ph.D. degree at this time; however, students may pursue a Ph.D. with a strong emphasis on fire protection engineering by enrolling in the doctoral programs of other departments in the A.James Clark School of Engineering, such as Mechanical, Aerospace or Civil Engineering. Department of Fire Protection Engineering faculty are affiliated with these departments and can serve as Ph.D. advisors. Students must fulfill the requirements of the department in which they are enrolled. Information on Ph.D. degree options may be obtained from the FPE Director of Graduate Studies, Professor Arnaud Trouvé. It depends on which program you choose. The M.S. program requires successful completion of eight (8) approved courses (24 credits), plus six (6) credits of thesis research (30 credits total). The M.Eng. program requires successful completion of ten (10) approved courses (30 credits total). For information on Combined Bachelor's / Master's program course requirements, please visit the Combined Bachelor / Master of Science or Combined Bachelor / Master of Engineering program page for more information. The M.Eng. program and Graduate Certificate program allow students to take courses online, on campus, or both. The M.S. program is an on-campus program. Requests to take online courses are evaluated on a case-by-case basis. I am an international student. Do I need to take the TOEFL or IETLS ? Applicants from non-English speaking countries may be required to provide evidence of proficiency in English by submitting scored from the Test of English as a Foreign Language (TOEFL) or the International English Language Testing System (IETLS). For more information, visit the university's office of International Students and Scholars Services (ISSS) and ISSS's graduate admissions page for a complete overview of the application process.